The Rio Grande, on the island of Tierra Del Fuego (The Land of Fire) in the deep south of Argentina, stands alone as the finest sea run brown trout fishery on earth. If you are going to travel to the ends of the earth then you really want to be fishing the best water and staying in the best lodges available. That is why we book the Nervous Waters lodges, they have the pick of the fishing and absolutely set the standard for service and luxury in this part of the world. Kau Tapen was the first fishing lodge on the Río Grande, opening its doors in 1984. Its name means “House of Fishing” in the Ona Language and here, in the heart of the Río Grande watershed, live the best pools on the river. If the walls of the magnificent lodge could talk, they would tell story after story of battles with huge trout over thirty-plus years. Kau Tapen Lodge embodies the fly fishing experience and to hundreds of anglers it is their fishing home. On the river, short walks and shallow wading are the norm. Single or two handed rods are both effective. Skate a bomber over a resting lie, or float a nymph next to a cut back for Sea- Run Trout you’ve only see in your dreams. Nick Reygaert is the founder of Gin-Clear Travel. He has carved out a career as a celebrated fly fishing film maker for the last 15 years during which time he has travelled extensively in pursuit of the world's best fly fishing. Nick has been travelling to South America since he first filmed Trout Bum Diaries - Patagonia in 2002! It was during that trip that he first got a taste for the giant sea-run brown trout of Southern Patagonia. While he fished the Rio Gallegos extensively during that trip it was the Rio Grande and its huge runs of ridiculously large trout that beckoned him back. Returning a few years later to the famous Kau Tapen Lodge, he was amazed at the quality of the fishery and lodge. It is a natural fit for our hosted travel program which promises our clients the very best lodges from the world's foremost fisheries. Day 0 : (Jan 11th) Fly to Buenos Aires, group gathers at airport and transfers to hotel for overnight stay. Day 2 - Day 7 : (Jan 13th - Jan 18th) Full days guided fishing and accommodation at lodge with full board. LODGING DETAILS: Built in 1984, Kau Tapen Lodge was designed to offer rods maximum comfort during their fishing trips, as well as easy access to the best pools on the world famous Rio Grande. It accommodates up to 10 guests (and occasionally 12) in en-suite single rooms to ensure privacy and comfort. The lodge has Ten en suite single rooms; some offer a king bed, while some have one queen, and others are furnished with two doubles. A large living room opens up to peaceful vistas of the valley and includes a roaring fire and a well stocked bar. The lodge also boasts a tackle shop with an excellent selection of Sage rods, quality fly reels, flies, lines, Patagonia clothing, and other fishing essentials. In addition, guests have full use of the lodge’s fly-tying table and equipment. 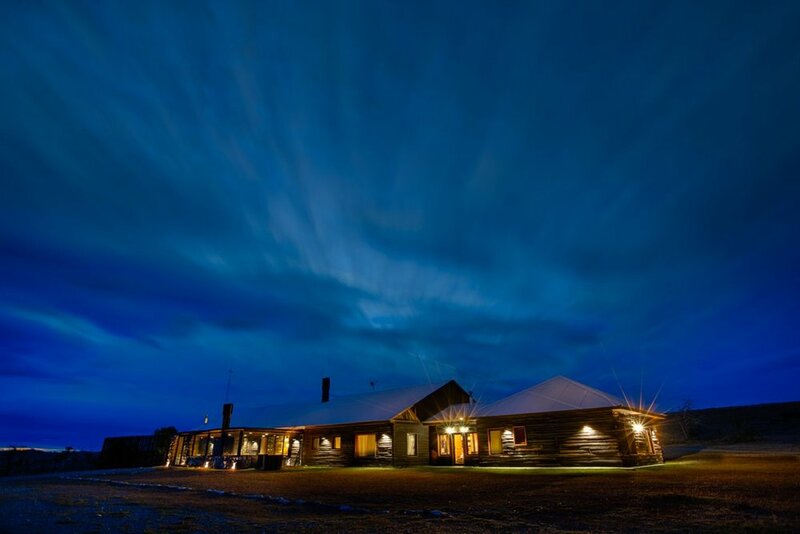 Additional Kau Tapen highlights include two wading/fly gear rooms, a full spa with jacuzzi, a sauna and Finnish steam bath. FOOD & BEVERAGE: The lodges kitchens come to life through the use of fresh and regionally representative meats and produce. By combining these elements, we create delicious flavors and varied textures that harbor hidden stories and package traditions on each plate. A top-notch team of experienced national and international chefs, trained in both classic and avant-garde culinary techniques, execute our food. With an artisan’s touch, chefs prepare every dish by scratch to be served at a minute’s notice. 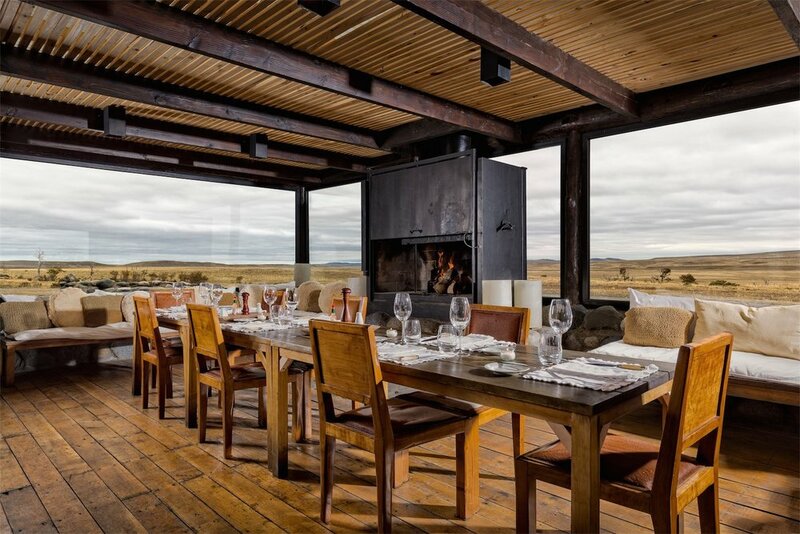 In addition, our inspired lunch and dinner menus are paired with some of Argentina’s—and the world’s—best wines; Bodega Catena Zapata. In addition to our focus on fresh food with organic origins, we also celebrate our Argentine heritage with a wine partnership that brings truly world class wines to our lodges. We feel that the food we present and the wines we serve should mirror the sporting opportunities we offer—and be the very best available. While our vast country offers many options for traditional activities such as riding, hunting, eating good meats, and drinking good wines, we have chosen to blend fine food and outdoor activity at an even higher level. We feel our offerings from Bodega Catena Zapata blend perfectly into our harmonious niche in the sporting environment. These are truly great wines that compete on the world stage and in addition to enjoying your sporting holiday and our excellent menus, we also hope you will also take note of our wines. They hold a special place in our culture and we are proud to serve them to you. And don’t forget to save room for dessert. From homemade ice creams to classic sweets and pastries, we have you covered. LENGTH OF STAY: The typical lodge package at Kau Tapen is six (6) days of fishing. NON-ANGLING ACTIVITIES: Kau Tapen is situated in a very remote part of Argentina, and overall, this is a fishing-focused operation. There is very little for non-fishing partners to enjoy other than the luxury and serenity of the lodge. INTERNET/COMMUNICATION: Kau Tapen lodge has telephone and Internet services for guests. $20 pounds. The frequency with which they return to freshwater is also an indicator that the fish face few threats. It’s also an example of the benefits of catch and release. $9-weight helps you to drive your line into or across the wind when necessary. Given the Rio Grande’s moderate flow and generally even gravel bottom, you’ll find an 8 or 9 capable of doing battle with even the river’s largest sea trout (15 to 25+ pounds), while it ensures the most action with smaller sea trout (4 to 10 pounds). For fishermen traveling to Kau Tapen, we recommend that you fly from Buenos Aires' Jorge Newbery Airport (AEP) to Rio Grande Airport on the island of Tierra Del Fuego. ARRIVAL & DEPARTURE DETAILS: When possible, we suggest that you arrive the night before the start of your week at the Lodge, which will give you some time to look around the town of Rio Grande and get acclimatized. Saturday morning you will be picked up at your hotel by the Lodge's transfer vehicle and driven to the lodge, a trip of approximately 1 hour. There are a number of comfortable hotel options in Rio Grande. Gin-Clear's services are completely free! When you book a trip with us, you never pay more than when you book directly with the lodge or outfitter. All prices listed below are per person, based on double occupancy, and quoted in US dollars. Trips of any length can be arranged. WHAT'S INCLUDED: • Transfers Río Grande, Lodging in private rooms in the lodge (singles and doubles rooms), Beer and non alcoholic beverages, Breakfast, lunch, snack and dinner, fly fishing guide (2 anglers per guide). WHAT'S NOT INCLUDED: International airfare to Buenos Aires (EZE), Domestic airfare from Buenos Aires to Rio Grande, Hotel and meals in transit, Personal equipment, all fishing gear, flies and tackle, Argentina entrance and reciprocity fees, Gratuities for guides and lodge staff.